Over the last few years the role of home carers has changed out of all recognition. Home carers now assist with a whole range of personal care tasks, many of them involving moving and handling, peg feeding and catheter care. As home care staff you are at risk of slips and trips, infection, stress and all of the issues that everyone faces at work. However, as home care staff you often work alone, placing you at increased risks of aggression or violence from service users as well as putting you at risk as you travel between visits. Experiencing aggression can increase stress leading to depression, anxiety and other longer term health conditions which affects your employment. Whether you are employed by an agency or self employed, if you work in someone else’s home your employer has a legal responsibility to make sure you have a safe and healthy working environment. Your employer should prepare a written risk assessment before carers visit. 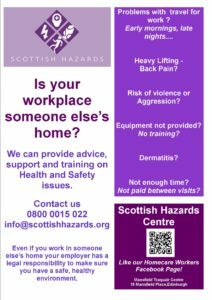 If you have concerns about any aspect of your working environment (for example, hoisting equipment, electrical appliances, asbestos, verbal abuse) you should ask for a copy of this assessment so you and your employer can resolve your issues.